Viking Vets - Andy Valenzia - Your local vet based at Chevening, Station Road, Henbury, Bristol BS10 7QQ. Andy joined Viking Vets as a vet in August 2016. 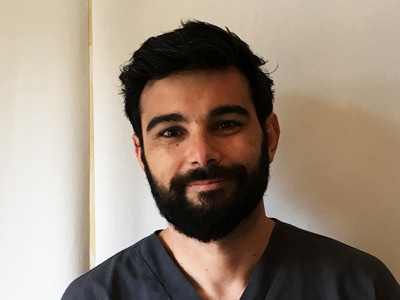 He grew up in Dubai and moved to the UK to study veterinary medicine at the University of Bristol where he met his wife Amy (who he job shares with here at Viking). Andy is keen on all aspects of general practice, but particularly enjoys soft tissue surgery - especially keyhole surgery. Outside of work Andy has been busy renovating their new family home and spoiling his daughter (soon to be joined by daughter number two). He is a keen grappler, practising Brazilian Jiu Jitsu/Submission Grappling whenever he gets the chance.